Interesting take on the overdrive/fuzz market, lots of useful sounds that will definitely get you noticed. Like its other pedals the Narlie! Dude comes with illuminated controls, true bypass switching, Neutrik jacks and sturdy metal housing. DDyna Music Co. describes Narlie! 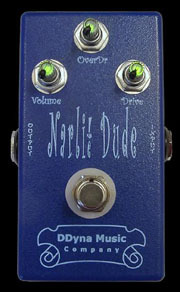 Dude as a drive/overdrive capable of achieving 50db of gain! VOLUME: Sets the output level. DRIVE: Pre-Amp drive – 32dB to 50dB. OVERDRIVE: Medium-hard limiter – medium to gritty limit. The unit can be powered via a 9v battery or a 9V AC adapter (not supplied). Like the Thinman, to get to the battery you have to unscrew the bottom of the pedal. The 9v AC input pin/tip is not labeled so you can fry the pedal with higher than 12V dc voltage, although wrong polarity is ok as it has polarity reversal protection and it just won't power up if connected the wrong way. As with the Thinman, the tip is negative and the ring positive but labeling it would be very handy. The pedal is housed in a sturdy blue metal box. Like other pedals from the DDyna line, the controls light up from the inside which looks cool on stage and helps for quick adjustments. The Narlie! Dude is a very sonically interesting pedal. Considering that DDyna lists that as its most punishing pedal (50db gain increase!) and bearing in mind the name, I was actually surprised that this pedal was rather gentle. I wouldn't call it tame but it did the job of an overdrive with some slight fuzz. The controls are a little weird to get accustomed to so I just used my ears. For example what is labeled as "Overdrive" acts more as a limiter and having both control all the way to the max created somewhat of a volume drain which I had to compensate with the Volume control. On a clean amp I managed to get a nice clean blues tone with some mild breakup, a solid bluesy lead tone and at its most extreme, a 70s distortion/fuzz sound, akin to Cream, Led Zeppelin, Black Sabbath tones. If you're looking for metal tone - this one doesn't have it, unless you like your metal on the retro side. On a tube amp set to crunch "the Dude" can get more raucous and roar with some serious punch but the distortion remains controlled and punchy. While not being a huge fan of fuzz in particular, I liked what this pedal does in general. You can go mild and bluesy, or you can get really Narlie! with the dude - the choice is up to you. Despite the strangely labeled controls, this pedal has lots of great tones, it is unique in both design and sound.